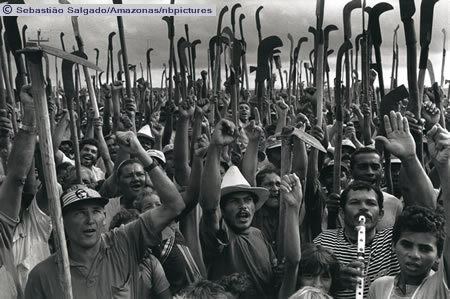 A large encampment with 2,800 families was formed on the lands of the Cuiabá plantation in the Xingó sertão along the São Francisco river. The people lived here for several months, enduring hardship in the hope of the latifundio-expropriation decree that was finally adopted on 6 May 1996. This is a demonstration by the peasants in commemoration of that victory, which in reality is a simple act of justice. Sergipe, 1996.